This Ongoing War: A Blog: 24-Mar-17: Our daughter's smiling killer: "Shocked" that US "decided to go after her for no obvious reason"
This is about a stunning article authored by Ali Younes and published by Al Jazeera in Arabic on Wednesday and in English yesterday (Thursday). What they have done is put out an entirely uncritical account of a vicious, boastful convicted murderer's version of why she should be left alone and not have to face justice. The reporter does not challenge a single one of this fugitive-from-the-FBI's claims. People have told us it really comes down to a sick tribute to her hideous achievement. We certainly see it that way. George Orwell would have understood and been impressed by the achievement. In the text that follows, we have interspersed our own comments (in black) with the English version of the Al Jazeera article as published (in purple). 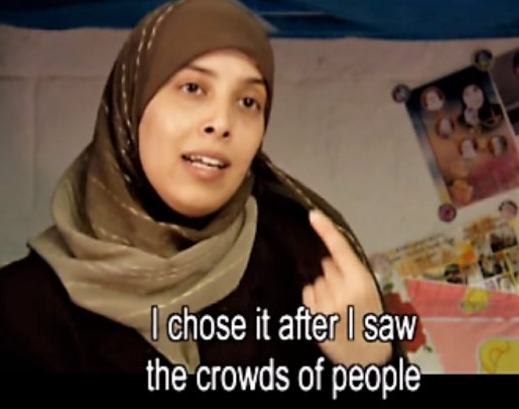 Amman, Jordan - Ahlam al-Tamimi, 37, never imagined that the quiet life she led for several years in Jordan would be turned upside down when the United States Department of Justice filed criminal charges against her demanding her extradition from Jordan and placing her on the FBI's most wanted list. Our comment: She was freed via an extorted commutation of sentence. Israel was extorted by the Hamas terrorist regime which illegally held captive and incommunicado an Israeli combatant, Gilad Shalit, for five years, eventually trading him for 1,027 convicted Arab terrorists imprisoned by Israel. Tamimi was one of them. Not a single prisoner received a pardon. Instead, their sentences were conditionally commuted - with the conditions including an undertaking never to engage again in terrorism or incitement to terrorism. 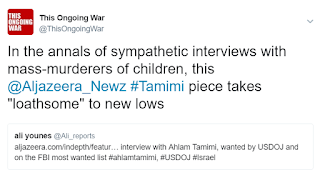 Tamimi was serving 16 life terms after confessing to being the mastermind of the Sbarro pizzeria massacre, an especially sickening and horrific terror attack that targeted children and woman. Tamimi was the one who did the actual targeting and, as she has boasted repeatedly, picked the target with great care. She brought the bomb by bus and taxi from a PA-controlled town in the Samaria district into Jerusalem. That bomb was a young newly-religious fanatic from well-to-do family: not poor, not uneducated, living neither in misery nor despair: a human bomb. He was equipped with an explosive-laden, purpose-built guitar case on his back surrounded by a large number of nails to magnify the flesh-ripping effect. Tamimi walked him to the central Jerusalem intersection where the Sbarro pizzeria stood at the time and where, after giving her enough time to flee to safety, he exploded while standing next to our 15 year-old daughter and her closest friend, the 16 year-old daughter of our neighbours. Both girls, and 13 other innocent victims, were killed. About 130 others, many of them on the street outside the pizzeria, suffered life-changing, often horrendous, injuries. Tamimi explicitly breached the conditions of her commutation-of-sentence almost from the first day after her release. Under the terms of the release she is obliged, if Israel can re-capture her, to go back to prison and complete her 16 life terms. 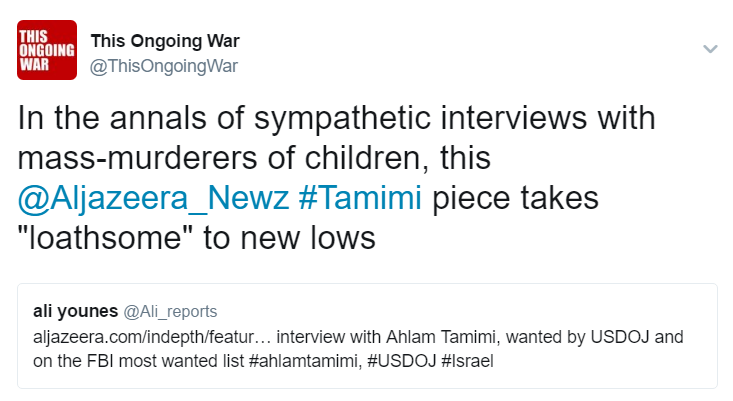 Does all of this entitle Tamimi to what the article calls "quiet life"? But wait, it gets worse. 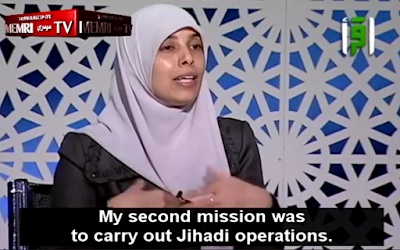 In an interview with Al Jazeera at her home in the Jordanian capital, Amman, Tamimi said that her ordeal with the US extradition request started last September when she was arrested by the Jordanian branch of Interpol while she was driving to visit her parents. 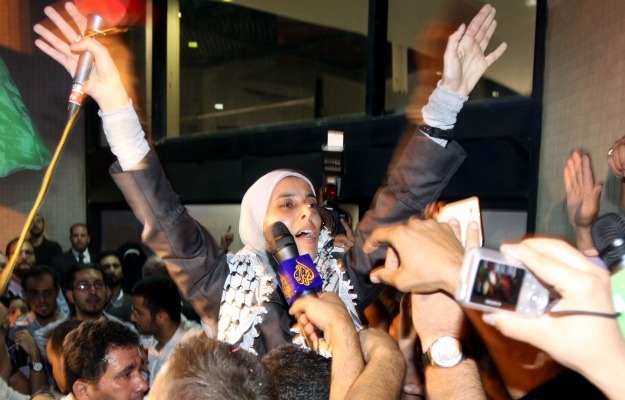 After spending one night in jail, she posted bail and started her legal fight against her extradition through Jordanian courts, which ended last Tuesday, seven months later. Our comment: Who is "the Jordanian branch of Interpol"? They probably mean the Jordanian police. Interpol doesn't have police. It connects police forces around the world with information and co-ordination. And that's an ordeal? For a convicted, confessed mass murderer? Taken into custody for a single night and then released? Knowing something about the kind of extremist values Al Jazeera espouses, we shouldn't be surprised by the undisguised way this reporter spins the interview. But it's infuriating to us to see how seriously they are taken as a credible source of news and analysis. When asked why she thinks the US government decided to go after her after all these years, and after she was tried, convicted and served time in Israeli jails, she said: "I was really shocked at the American behaviour. Our comment: The claim that she's shocked is laughable. Her post-2011 high profile terror incitement activities make her liable to re-imprisonment by Israel. We assume that's why she has never ventured further than certain parts of the Arab world in the past 6 years: to Algeria, Kuwait, Lebanon, Qatar, Tunisia and Yemen. And if she's not aware of Title 18, United States Code Section 2332a(a)(1) which prohibits using a weapon of mass destruction against a US citizen outside the US then she should. She's a journalist and nowhere near as naive as she now pretends to be. Also: she should get better lawyers. "The US government, who is always trying to solve the problems of the world, especially in the Middle East, has decided to go after one woman for no obvious reasons." Our comment: No obvious reason except for her having murdered US citizens and proudly confessed to her sickening crimes. In 2013, the US government filed under seal a criminal complaint against Tamimi based on her assistance in an August 9, 2001, bombing of Sbarro Pizzeria in Jerusalem that killed 15 people, including two American citizens. The criminal complaint was unsealed publicly last week. Our comment: An assistant? No, she planned and masterminded the massacre. In dozens of TV, press and social media interviews since walking free, she has highlighted her key role, not hesitating to exaggerate her achievements and make up explosions that never happened when that suits her. For instance, in a June 2012 interview on Kuwait's Iqraa TV channel [video here] she explained her work with Hamas:: "I was assigned three missions. The first mission was to spot locations suitable for Jihadi operations. I would go to Jerusalem and walk around in the areas frequented by the Zionists... I would surveil suitable locations... I would submit reports to the cell commander and this report would be studied... My second mission was to carry out Jihadi operations. I was assigned this mission. I would take explosive devices... I learned how to operate one of those explosive devices, and I took it to a supermarket..." She then goes on to claim that the supermarket - the Co-op Supermarket that was located in the basement of the Mashbir department store on King George - "completely exploded. At the time, the Israelis said that nobody had been killed or wounded... it was normal for them to conceal the number of casualties, in order to avoid panic among the Zionists." In reality, no one was injured or killed, and while the basement was damaged, the rest of the building - a Jerusalem landmark until it was substantially gutted and renovated this year - was undamaged and intact. She's inventing things to enhance her standing. Federal prosecutors accuse Tamimi of having agreed in the summer of 2001 to carry out attacks on behalf of the military wing of the Palestinian Hamas movement and having travelled with the restaurant bomber to Jerusalem. Prosecutors say that she instructed the bomber to detonate the explosive device, which was hidden in a guitar, in the area. Our comment: Accuse her? She doesn't deny any of this. You can hear her tell it over in her own words on a variety of different websites. For instance, in that same 2012 Kuwaiti TV interview, she begins with this: "I was a journalism student... and I was working in the media and the press. This allowed me to become a member of the Palestinian Journalists Union. The union card enabled me to enter Jerusalem in order to conduct interviews. This drew the attention of the 'Izz Al-Din Al-Qassam Brigades. They realized that I could enter and leave Jerusalem, without the knowledge of the Zionists... This made them ask me to join the 'Izz Al-Din Al-Qassam Brigades, and I immediately accepted." The Brigades are the operational arm of Hamas' terrorist activity. Tamimi told Al Jazeera that she never knew that American nationals were killed in that bombing. She also said the Israeli government never mentioned that during her trial. "The first time I ever knew that Americans were killed was when the Interpol in Jordan told me about the charges filed in the US against me," she said. Our comment: We don't know what she knew or didn't know. But as a journalist with a lot of time on her hands during her eight years in a wired, well-facilitated Israeli prison, not knowing after all these years that there were American victims is unlikely. Also: it makes no difference to her criminal culpability. It's utterly irrelevant. Our comment: Wrong. We, the two of us, began our pursuit of her via the DoJ in early 2012, three months after she walked free from her Israeli cell. No, we're not US-based. And yes, we are pro-Israel. ...even after I was convicted and spent many years in Israeli prisons." Our comment: The massacre took place on the afternoon of August 9, 2001. She was arrested in September 2001 when she was 21 years old. She pleaded guilty to all charges at her trial in June 2003 and was sentenced in September 2003 to 16 terms of life imprisonment. She was released in October 2011. Sixteen terms of life imprisonment would be "many years in Israeli prisons". What she served was not. This is the woman who says she wants to put it all behind her. our 15 year old daughter Malki. Does the Al Jazeera guy know this? Last year, Jordanian lower courts handed her legal victory when it rejected the US request on the ground that the US-Jordan extradition treaty signed in 1995 was unconstitutional because it was never ratified by the Jordanian Parliament. Our comment: There's much to say about this claim, all of it critical and mostly dismissive. Maybe later. Suffice to say for now that in a monarchy where the king changes prime ministers and governments more often than some presidents change their suits, there's an inherent problem in paying so much respectful attention to a constitution. Jordanian law and what is legal and illegal depends on one individual. If they wanted to extradite her, she would be in the US today. And let's note that a variety of Jordan versions have emerged of what its courts ruled and when, and what its constitution says. A clear picture we're certainly not getting. They say whatever they need to say. We received a formal response from the DoJ in Washington this week stating its official view. They say the Extradition Treaty between the US and the Hashemite Kingdom of Jordan was signed on March 28, 1995 in Washington DC. This, please note, was followed by the exchange of instruments of ratification on July 29, 1995. In the DOJ's view, the Treaty entered into force that same day and continues in force. It is listed in "Treaties in Force: A List of Treaties and Other International Agreements of the United States in Force on January 1, 2011," the Department of State's publication that that provides information on treaties and other international agreements to which the United States has become a party and which are carried on the records of the Department of State as being in force as of the stated publication date. In simpler words, the US which is the other party to a two-sided agreement (and arguably Jordan's most important friend and backer in the world) has no doubt, and for the record, that the treaty between them is fully in effect. The DoJ told us that on January 25, 1997 - more than two decades ago - the Jordanian Court of Cassation (evidently the same court that ruled the treaty ineffective this past Monday) held that the Treaty was unconstitutional. That was said to be because Jordan had not submitted the Treaty to its parliament for endorsement. And in the twenty years since then, Jordan's parliament has still "not approved the Treaty" in the language of the DoJ letter to us. So why is the same question being presented to what we are told is Jordan's highest court over and again? And who is presenting the other side - the argument that Jordan can and must extradite. We may never find out but we are trying. But clearly the Jordanians, for whom Tamimi is a national (meaning Palestinian Arab) hero, won't be offering any clarification. On Monday, Jordan's Supreme Court agreed with the lower court's decisions making her extradition legally impossible for Jordan. "All of the Jordanian courts agreed with our position to reject the American request because it was illegal according to Jordan's constitution," Hikmat Rawashdeh, Tamimi's lawyer, told Al Jazeera. Our comment: So if the higher Jordanian court agreed with the lower Jordanian court and both say Tamimi cannot be extradited, who appealed from the lower court which is itself a court of appeal? And whose decision, about what, is being appealed? About Mr Rawashdeh, Tamimi's lawyer in these recent proceedings, here's something that Wikileaks knows about him: "The defendants' lawyer [in another earlier case] Hikmat Rawashdeh argued during his closing remarks that, "Most Jordanians wish to fight Americans and Israelis and I am one of them. Should I be punished for this intention? If this is the case then the authorities should punish the entire Jordanian population." [Source: Wikileaks from March 2006] We can surely rely on him to tell us the truth, right Aljazeera?. "The constitution bars extraditing any Jordanian citizen without the due process of the law or proper extradition request, which was not done by the American side," he added. Our comment: Maybe yes, maybe no. Certainly Aljazeera's clever reporter didn't express a view on that or consult any other experts. Our experience is the Department of Justice people are competent lawyers and know how to fill in forms. The reference to "due process" from a Jordan-Palestinian mass murderer is a sad joke. We learned from speaking with the American law-and-order people with whom we have been in steady contact for some years that there have been several extradition requests made to the Jordanians over the years. One succeeded - the case of a fugitive called Eyad Ismoil, extradited to the US in 1995. Ismoil, who like Tamimi and about 70% of the Jordanian population considers himself a Palestinian, drove a bomb-laden truck into the parking garage of the World Trade Center in 1993. That bombing attack killed six people and injured more than 1,000. The U.S. District Judge hearing the case ordered Ismoil to pay more than $10 million in restitution "just to make sure that you never make a dime out of this." Rawashdeh also said that Jordan's constitution prevents prosecuting an accused person with the same offence twice, similar to the "double jeopardy" clause in the Fifth Amendment to the US Constitution. Our comment: Double jeopardy has no application in Tamimi's case - we have heard this from a string of legal experts. She is being charged in a different country on different charges. Al Jazeera asked the US Justice Department for its reaction to the Jordanian court ruling and whether the US government would review its extradition treaty with Jordan or renew its demand for extradition. "As a matter of policy, the Department [of Justice] generally does not comment on extradition-related matters," Peter Carr, a spokesman for the US Justice Department wrote in an email to Al Jazeera. As a result of Jordan's Supreme Court decision, Tamimi is no longer wanted by the Interpol in Jordan. She is still, however, a wanted person internationally by Interpol and could face arrest should she travel outside Jordan. Our comment: We're checking with Interpol. But this is probably true. Once the Jordanians told Interpol their law did not allow for Tamimi's extradition, Interpol had nothing more to do. Tamimi was a 20-year-old college student when she was arrested in Israel and pleaded guilty during her trial. She was sentenced in 2003 to 16 life terms in prison for her role in the bombing. She said that after her arrest, she was held for 43 days, during which was subjected to physical and psychological torture. "I was subjected to cruel treatment by Israeli jailers, and was never allowed to even have proper hygiene or make contact with family or have access to a lawyer," she said. 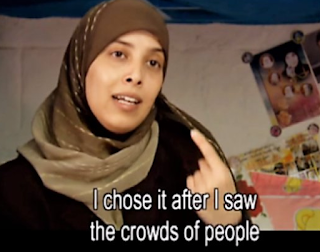 After spending 10 years in Israeli jails, during which she was rarely allowed to talk to her family, Tamimi was freed from prison in 2011 as part of a prisoner exchange between Israel and Hamas. Our comment: Some prisoner exchange. 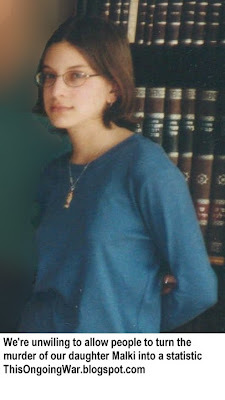 Shalit was kidnapped and held hostage - a war crime - for more than five years by Hamas. He was denied visits from the Red Cross; was not allowed to communicate with family members (to which he was entitled under the Geneva Conventions).The Shalit Deal, consummated in October 2011, resulted in prisoners collectively responsible for 569 Israeli deaths, including Tamimi, walking free. Tamimi's deprivations, if not entirely invented, are trivial by comparison with Shalit's. And if she complained about them to the Red Cross or to one of the many accessible and sympathetic Israeli lawyers, it remained a secret. Which is not what we believe. Telling the truth comes hard to this woman. She said she was in utter shock that the US government decided to go after her, insisting that she committed no crimes against the US government or on US soil, or that she tried to kill US citizens intentionally. Our comment: Tamimi's shock again: she's being poorly advised on how US law works. Or pretending that there's some merit to her contentions. There's none. Tamimi said she witnessed many of her friends and fellow students killed in "cold blood" by the Israeli army. Our comment: We have yet to hear of an Islamist terrorist who does not justify his or her atrocities by referring to vaguely described Israeli actions. In 2000, the Palestinian occupied territories were engulfed in a bloody uprising called the "Al-Aqsa Intifada" against the Israeli occupation. Between the years 2000 and 2005, Israeli forces killed 3,136 Palestinians while 431 Israelis were killed by Palestinians. "From a Palestinian, as well as international law perspective, it is perfectly legitimate to resist the Israeli occupation," she said. "We only wanted freedom for our country, not to kill Israelis or others for the sake of killing." Our comment: Tamimi masterminded an armed assault - with a bomb - on a child-filled pizzeria timed to happen on a school vacation afternoon, having looked for one that attracted large crowds of children and their mothers at that hour. She wants us to understand that this was about freedom. Freedom for which country? Does Hamas - which sees itself in a religious conflict - even claim to want to create a country? She denies killing Israelis for the sake of killing, but her actions then and since demonstrate how insincere and false her denial is. 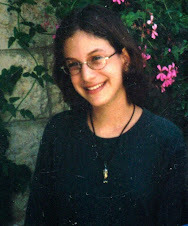 That she didn't want to kill Israelis is a bald-faced lie that persuades her backers. She has said publicly - and been praised for it in the demonic circles from where her support comes - that she wanted to kill Israelis, she wanted to kill religious Jews, that she wanted to kill children. She sought a Jerusalem location where she could achieve these goals. The Sbarro pizzeria on that hot afternoon supplied everything she sought. The self-serving nonsense of "we only wanted freedom" comes directly from the Islamist terror playbook. It works; headline writers love it and it's a great fig-leaf when your real position is indefensible. About the freedom of our daughter Malki and all the others whose lives were terminated or tragically damaged by the woman who "never wanted to kill", we simply don't ask. The answer is obvious. Since her release from Israeli jails, Tamimi said she has tried to put the past behind her and tries to have a normal life for and her husband. Soon after her release from jail, she got married to Nizar al-Tamimi, 44, a relative, who spent 19 years in Israeli jails for killing an Israeli settler in the occupied West Bank and was released at the same time as Ahlam. Our comment: Tamimi wants to put the past behind her? That's understandable - but absurd. She recounts the past and her glorious role in it at every opportunity for audiences of millions of people and on this, she is convincing. She has said explicitly and repeatedly that she regrets nothing; she would do it again. She glories in the fame and adulation she gets for her murders from every part of the Arab world (we're willing to provide evidence to anyone who wants). She has said she feels no sympathy for the Israeli children she murdered or their families. She said it again today to Associated Press - see their fawning interview with her here. She was asked, immediately after reaching Jordan in October 2011, whether she would do it the same way, on the same huge scale, if she could go back in time. Her response [here] ought to be engraved in cement: "Of course. I do not regret what happened. Absolutely not. This is the path. I dedicated myself to Jihad for the sake of Allah [nothing to do with national liberation or resistance - it's religious warfare for her and her fellow Islamists], and Allah granted me success. You know how many casualties there were [at the Sbarro pizzeria]? This was made possible by Allah. Do you want me to denounce what I did? That’s out of the question. I would do it again today, and in the same manner." Clear enough? So what exactly is it that Al Jazeera thinks she wants to put behind her? This woman's life is the polar opposite of someone who is trying to get past the savage, hateful crimes of her younger years (she's now 37). She will say whatever advances her cause at that moment and for that audience. Why didn't the clever reporter from Al Jazeera ask her to comment on the normal life that Malki so much wanted, and all the other victims? Or whether she feels regret or understanding or sympathy or a deeper understanding. But the Al Jazeera tribute isn't about truth. It's about getting honoring a woman who is already on a pedestal for getting away with murder and satisfying the blood-lust of an entire society. "I would like the American people to look at the case against me as an unjust case and speak out to stand with me and the truth," she said. "I want to lead a normal life, continue my education and raise a family. All l want now is for the US government to just leave me alone." Our comment: We're the parents of one of her murdered victims and it's unbearable for us to listen to the sickening cynicism of a completely unrepentant killer who escaped punishment and complains that the prosecutorial case against her was unjust. The only aspect that is unjust is that she is alive and free. If we can't extradite her, kill her. Kill her family, kill her kids, kill everyone who's ever met her. Kill them all. What's the worst that happens? The NYT complains? No, we want justice, not revenge. She ought to be back behind bars and to stay there for the rest of her life. That's our goal.